Enterprise information is on the move. Today, there is one mobile phone per two people on the earth. In many countries, there are more mobile devices than PCs. And more and more workers are using smartphones and other devices to stay connected - and productive - in and out of the office. 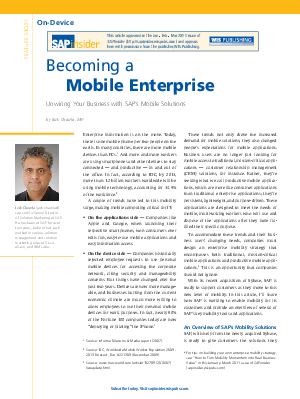 This article will discuss how SAP is working to enable mobility for its customers and provide an overview of several of SAP's key mobility tools and applications.